Happy Friday! I haven’t done one of these Five Friday Favorites in a while and I have a few new things I am excited to share with you! If you have my new cookbook, you may have come across a recipe for a quick vegetable curry that calls for yellow curry paste. When developing that recipe, I searched high and low for a really fantastic, authentic, and clean Thai yellow curry paste, which led me to this Mae Ploy yellow curry paste that I am just crazy about. There are many different kinds of Thai curry pastes and yellow is my favorite. There’s so much flavor from garlic, shallots, ginger and lemongrass. I love having this in the fridge for a last minute punch of flavor. It would take a lot of time and a lot of random ingredients to make the same paste from scratch. It is a little spicy, but you don’t have to use a lot. It is available on Amazon with free prime shipping! If you are very into pasta like my family is, you must be very, very grateful about all of the “alternative” pastas that have been popping up on the market. You can find a pasta made out of just about anything these days; brown rice, quinoa, black beans, red lentils, etc. In my opinion, you aren’t fooling anyone with these, and while I think they are great subs, they are definitely not exactly like “normal” pasta. However, I am really into legume pastas right now for their added nutritional content and just to mix it up a little. This pasta from Banza is the same color as traditional pasta, which is a major plus if you are working with picky eaters. And the texture is pretty darn close to wheat pasta if you ask me! Now believe me when I say there is nothing wrong with indulging in a bit of pasta every now and again, but what is so great about this is that not only is it “not bad” for you, like white pasta, but it is extremely beneficial for your health, too! Just one serving provides a whopping 25 grams of protein and 13 grams of fiber!! What this means for me is that I don’t need to prepare extra protein with this pasta for dinner. Banza pasta comes in several varieties, too, like shells, macaroni, spaghetti, rotini, etc. They also have a line of boxed mac and cheeses, and while I don’t necessarily condone boxed mac and cheese, if you are going to do it, fair enough, but what a difference if you could be getting chickpeas into your kids while you do! Banza pasta is available for purchase on their website, on Thrive market, and you can also check out where they sell it locally in stores near you! This may seem like a silly “favorite,” but Glamsquad came to my aid when I was in a pinch last month in NYC. I don’t get my makeup or hair done very often, but I like to before television appearances. Despite what you might think, tv studios don’t do hair and makeup for guests, only touch-ups. A friend of mine was recently homebound for medical reasons and used Glamsquad to make her feel pretty and fresh. She recommended that I use them in NYC since they would come to my hotel room as early as 6:00 am. Done! I’ve used them a couple of times so far and they’re always on time and they do a great job. You make your appointment through an app. The price for a blow dry is $50 + tip, which is only $5 more than Dry Bar. And they come to your house! The downside is that Glamsquad is only in Los Angeles, New York, Miami and Washington DC at the moment. I know it’s not a necessity, but if you are traveling to one of these cities for a special occasion, it’s an easy way to treat yourself to a beauty boost for a reasonable price, or treat someone else who can’t get out of the house. They do hair, makeup and nails! I know, I know. But can you blame me? If there is one thing on this blog that I would ever want to promote, it would be this book! This book is part of my mission, like my cooking classes, to help people cook more with unprocessed foods and in turn become healthier. 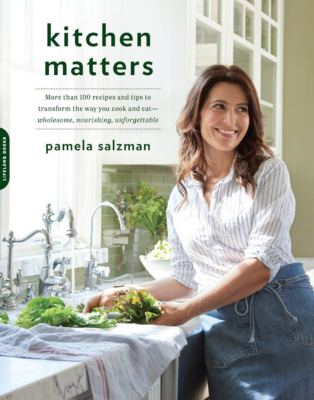 This book was written with the help of my cooking class students who helped me understand what challenges and fears people have in the kitchen, what common allergens and intolerances they face, and turned me into an expert in home kitchens. I wanted to be able to share with my blog readers and social media followers that I am able to share with my students in classes. But, having said that, if you have taken my classes, I made sure that there were plenty of “never-before-seen” recipes so that there was something for everyone! My favorite section is the salad section (surprise, surprise! ), and I think the vegetables section might be a close second and I am especially crazy about the chart for roasting every vegetable. I have also made the recipes adaptable almost every diet! You can purchase my book for a very reasonable price on Amazon, or if you are interested in a signed copy (personalized, too! ), you can order from my local bookstore, Pages! One small ask, if you are enjoying my book, would you kindly write a review on amazon? You can write a review even if you didn’t buy it on amazon. It would mean so much to me if you would do me that favor. The Amazon algorithm favors books with more reviews and will show the book to more amazon customers. So, thank you in advance! 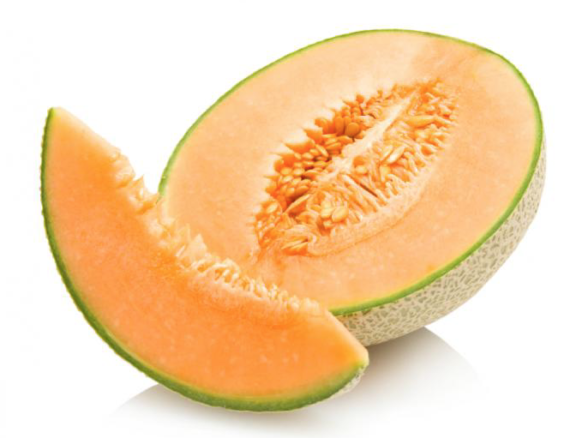 Cantaloupe is high in both Vitamin A and Vitamin C, has potassium, antioxidants, and even omega-3 fats in the edible seeds. When choosing a cantaloupe, look for one that has a nice and even beige color, is heavy for its size, and gives just slightly when you press with your thumb. But most importantly, the bottom eye of the cantaloupe should have a light, sweet fragrance to it. Store the melon on your countertop where it will continue to ripen until you break it down, at which point you can store it in the fridge for 3-5 days. There is a delicious cantaloupe granita recipe in my new cookbook. FYI: I am not getting paid by any of the above companies. This is not a sponsored post, not that I would mind a brand sponsoring a post ;). Just saying! Hi Pamela! I wrote my Amazon review at the end of June (when I made those awesome halibut burgers) but hope you get lots more as people cook their way through your book. I am inquiring about the Thermopen thermometer you used in your instastory live… what model do you recommend? There are so many on Amazon and I don’t see an $80 one. Lastly, who makes the double pronged skewers I saw on your shrimp today?? Thank you! Oh my goodness! Thank you so much and I am so glad you’re already cooking from the book! I think there is a Glamsquad in LA. A couple of months ago my LA cousin was in a rehab facility and family sent Glamsquad to her rescue! She since died But that day made her feel special her last couple of weeks! Yes, there is a Glamsquad in LA. I’m so sorry to hear about your cousin, but it’s nice to know she was taken care of in her last weeks.